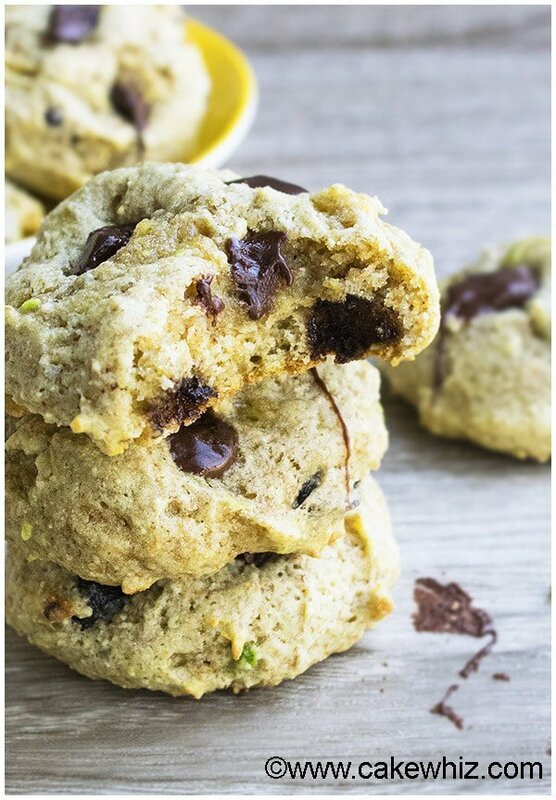 This quick and easy low fat healthy avocado cookies recipe replaces butter with avocados. They are soft and moist with a cake-like texture. For a while now, I have been eyeing these avocado cookies in my Mom’s recipe book. Since there was a lonely avocado sitting in my refrigerator, it was high time I made them! I know it’s a rather UNUSUAL combination but I like them! They are soft and moist and have a CAKE-LIKE texture. Also, if you are looking for vegan avocado cookies or low carb avocado cookies, this is not the recipe for you. 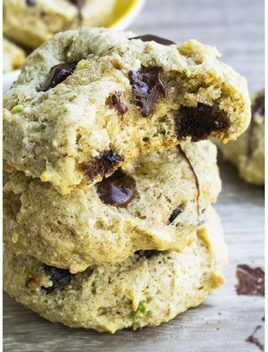 These quick and EASY avocado cookies are made withs SIMPLE ingredients that you probably already have in your pantry. All the unhealthy fats are REPLACED with an avocado. So, DON’T expect them to taste like buttery cookies! Enjoy them for what they are => LOW FAT cookies that are not going to rest on your hips forever! lol. These cookies with avocado instead of butter DON’T have a typical flat, round cookie shape either. They look like “poofy clouds” with a subtle green color…hehe. My son LOVES these avocado cookies without butter and can’t even tell that they have avocados…Yay! 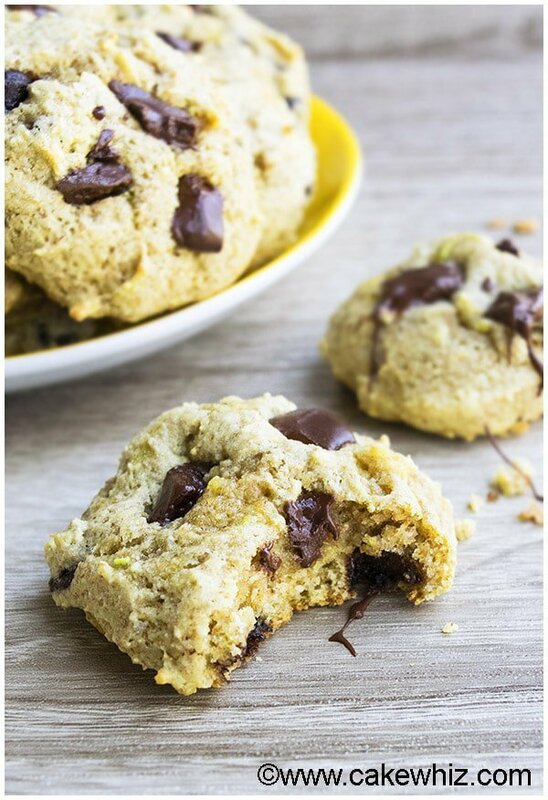 I have also used Splenda to replace sugar in this recipe to make avocado cookies without sugar and they weren’t bad but honestly, they were not as good as this version. By the way, if you are fond of avocados, I have a recipe for avocado marble cake that you might enjoy too. Make sure to use a RIPE avocado. Your egg must be at room temperature since it blends into the batter more smoothly. If you want to enhance the chocolate flavor in these cookies, increase the quantity of chocolate chips to 3/4 cups. You can reduce the sugar to 1/2 cups, if you prefer cookies that are not too sweet. You can can make these cookies with all-purpose flour only. However, I DO NOT recommend making them with only whole wheat flour since they ended up with a weird texture. Someone emailed me and wanted to know if we can make avocado cookies without flour and honestly, I haven’t had much success with that. Cookie dough must be chilled for at least 10 minutes. Don’t skip this step or else your cookies will expand too much, while baking and lose their round “poofy” shape. Cookies can be stored in a cookie jar at room temperature for up to 3 days. 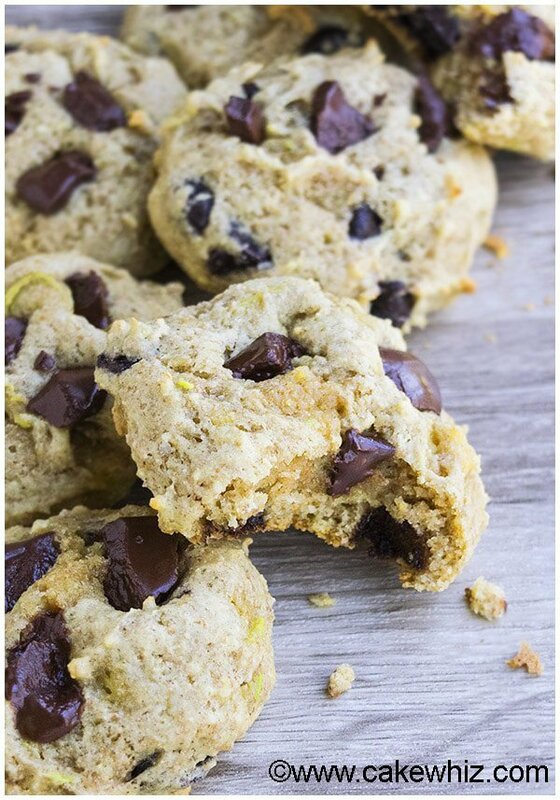 You can also modify this recipe slightly to make avocado oatmeal chocolate chip cookies. Just add 3 tbsp oats (quick cooking or regular). You can also replace chocolate chips with chopped nuts or even dried fruits likes raisins and cranberries. To make avocado peanut butter cookies, drizzle melted peanut butter on top of each cookie, once they have cooled down. How to make avocado cookies? The process is very simple. Start off by beating the egg and then mix in avocado, vanilla and sugar. Then, whisk together the flour and baking soda separately and dump this dry mixture into the wet mixture and mix until just combined. Scoop out dough onto a cookie tray and bake until golden brown. In a mixing bowl, beat the egg until fluffy. Add avocado and vanilla extract and mix again. Add the whole wheat flour, all-purpose flour, baking soda and mix until smooth. Use an ice cream scooper to scoop out dough onto a cookie tray, lined with parchment paper. Chill the tray for 10 minutes. Then, bake at 350 degrees for for about 15 minutes or util the edges are firm and golden brown. When the cookies cool down completely, store them in a cookie jar at room temperature for up to 3 days. You can add ¾ cup chocolate chips, if you want to enhance the chocolate flavor in these cookies. You can reduce the sugar to ½ cup, if you prefer cookies that are not too sweet. I’ve made it twice and really like how they turned out both times. I use half cup plain flour, quarter cup sorghum flour, quarter cup oat or almond flour, half teaspoon guar gum. The sweetness level is perfect for us with half cup brown sugar. We also used shaved block coconut sugar, which made more moist cakey cookies.